As Christian forces gained more lands from the various Ta’ifa kingdoms in the eleventh-century, the Muslim kings turned to Yusuf b. Tashufin, the ruler of the Almoravids of North Africa. His forces went into Spain, and at the Battle of Zallaqa (also known as the Battle of Sagrajas), defeated the forces of Alfonso (also called Alphonso) VI. This victory not only brought a temporary halt to the Christian advances on Muslim lands, but also led to the establishment of the Almoravid empire in Spain between 1091 and 1094. This account of the battle is from a ‘Abd al-Wahid al Marrakushi, written in 1224. 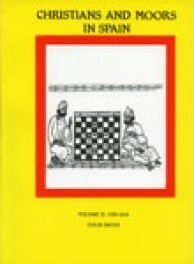 Unlike most other Arabic accounts of this victory, this work is mostly free of legendary and mythic elements. Al-Mu’tamid returned to al-Andalus happy with the assistance promised him by the Amir al-Muslimin; he did not know that his destruction lay in this arrangement. He drew a sword that he thought was for him, and did not know that it was against him. Yusuf b. Tashufin, the Commander of the Muslims, began the preparations to cross to the Spanish Peninsula in the month of Jumada I this year (began 14 August). He summoned all the leaders and commanders of the army and the chiefs of the Berber tribes whom he could call upon to fight. About 7,000 horsemen with a large number of infantry assembled and he crossed the sea with a vast army, embarking at the town of Sabta (Ceuta) and landing at the town called al-Jazirat al-khadra (Algeciras). Al-Mu’tamid met him with the leading men of his state, and displayed more reverence and deference towards him than the Amir al-Muslimin had expected. [Al-Mu’tamid] presented him with kingly gifts, presents and riches such as Yusuf could not imagine a king possessing. It was this that first kindled a longing for the kingdom of al-Andalus in Yusuf s heart. Alfonso (VI) – may God curse him! – was giving siege to one of the Muslims’ castles, known as al-Lit (Aledo). When he heard that the Berbers had crossed over, he abandoned the siege and returned to his own territories, mobilizing his army to meet the Berbers […]. The above-mentioned Yusuf then reviewed his troops at the fortress of al-Raqqa, and liked what he saw of them. He said to al-Mu’tamid `ala-’llah, “Let’s go on the Holy War that we came for, and attack the enemy.” He began to grumble about staying in the Spanish Peninsula, and to long for Marrakesh, and to belittle the power of al-Andalus. He was forever saying, “We took the affairs of this Peninsula seriously until we saw it, and now that we have seen it, it has sunk beneath all description.” [But] in doing so he was as one “happy to drink the froth” [i.e. pretending to want only the froth, while actually drinking all the milk]. Al-Mu’tamid left him, heading for Toledo. A mighty army assembled round al-Mu’tamid from different regions of al-Andalus, and the people were summoned to Holy War from other districts. The kings of the Peninsula reinforced Yusuf and al-Mu’tamid with as many horses, men and arms as they could; the total strength of the Muslims, including volunteers and mercenaries, was about 20,000 men. They and the enemy met where Christian territory began. Alfonso – may God curse him! – had already called up great and small; there was no one left in the furthest reaches of his territory capable of action whom he had not stirred. He came leading a powerful army, his main intention being to stifle the desire of the Berbers for the Spanish Peninsula and to inspire them with fear. As for the kings of al-Andalus, every one of them was paying him tribute; they were more than contemptible in his eyes and beneath his contemplation. Yusuf and his companions assembled, and he appointed someone to exhort them and preach to them. A sufficient number of them affirmed their vow and their eagerness to fight the Holy War and made light of martyrdom, to gladden Yusuf and the Muslims. Yusuf and his men began to pray, and when they had performed the first rak’a the Christian cavalry burst into them. Alfonso – may God curse him! – attacked at the head of his men, thinking that he would seize his opportunity, while al-Mu’tamid and his men were behind the Almoravids. That day produced such riches as no-one had ever witnessed before. The Almoravids grabbed their weapons and mounted their horses and the two sides became embroiled. Yusuf b. Tashufin and his men showed a perseverance, heroism and fortitude beyond the calculations of al-Mu’tamid, and God defeated the enemy. The Muslims pursued them, killing them on all sides, but Alfonso – God curse him! – escaped with nine men. This was one of the most celebrated victories in al-Andalus, by which God glorified his religion, elevated his word, and cut off Alfonso’s ambitions (may God curse him!) in al-Andalus, after he had been anticipating it coming into his possession and believing that its kings were his servants. All this came about through the pious intentions of the Amir of the Muslims. They called this battle al-Zallaqa; the encounter between the Muslims and their enemy occurred, as we have mentioned, on Friday 13 Ramadan 480 [sic] (12 December 1087). Yusuf b. Tashufin and his men departed victoriously from the scene, conquered for them and by them, and the men of al-Andalus were delighted with them, and regarded the Amir al-Muslimin as a good omen and a blessing. Prayers for him multiplied in the mosques and from the pulpits, his praises spread through the Spanish Peninsula in a way that increased his covetousness towards it. This was because al-Andalus, before his arrival, was facing annihilation by the conquests of the Christians and their exaction of tribute from all its kings without exception; and when God overcame the enemy and defeated him at the hands of the Commander of the Muslims, the people proclaimed his glory and love for him grew in their hearts. This entry was posted in Primary Sources and tagged 11C, al-Andalus, battles, Iberia, Spain. Bookmark the permalink.